An Antique Car | W. Wayne B. Posted on January 19, 2013	by W. Wayne B. Under the bridge lies a rusting hulk. The antique car was abandoned years ago. No one cares about its history. Years passed and the rust grew thick. Birds made nests in the broken headlights. Silent parasites consumed the metal. The shiny chrome cracked and faded. The city maintained the bridge. Traffic raced along its surface. Seasons left their mark on the car. People had forgotten the car long ago. Its quiet habitat raised many generations. The birds’ beauty was a blessing. I was pleased when I found its bounty. 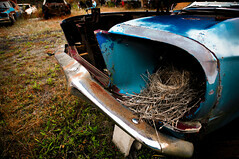 This entry was posted in Poetry and tagged abandoned, bird, blessing, bounty, bridge, car, history, home, old, poem, z1542. Bookmark the permalink.